A state as well known for its citrus produce as it is for its warm weather, Florida is indeed the tropics of the United States. Surrounded by ocean on three sides, the sandy soil of southern Florida is ideal for growing citrus, most especially oranges. The orange blossom is the state flower of Florida and rightly so. Oranges and other citrus fruits like them represent one of the most thriving industries in Florida. If Florida were to select a flower based solely on beauty, the lovely orange blossom might have competition from many other tropical plants and flowers, but the orange blossom has a special advantage. The orange blossom has a truly beautiful fragrance as well. The waxy white petals create a perfect five point flower with such a lovely scent it’s been used in commercial perfumes. 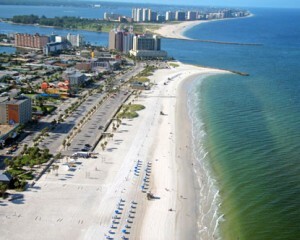 Florida is a diverse land of travelers, workers and those of leisure. But the simple beauty of the orange blossom and its fruit are so symbolic of this lovely land, the orange blossom because the state flower of Florida in 1909. The orange tree was not native to Florida, however. Like all citrus, the orange tree originated in Asia. But for a transplant, the orange tree has grown to capture not only the hearts of Floridians, but of the entire Untied States. 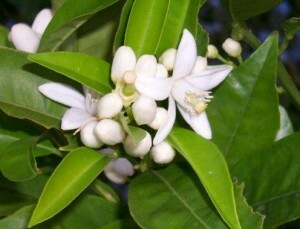 Orange blossoms appear in citrus groves in the spring. The flowers fade and the fruit appears during the fall and winter. New lovely blossoms begin to appear on the orange tree before the last of the fruit has been picked from the previous year. The orange tree is a fertile majesty made famous by the especially sweet nature of Florida oranges. Growing your own orange tree in order to produce orange blossoms is decidedly more complicated than enjoying orange blossoms in floral delivery. Orange trees require gritty soil and hot, southern moisture. They can be grown in any climate, however, so long as the soil is properly treated and there is a way to move the orange tree inside or to protect it during cold months. Orange trees can even be grown in containers and moved into the house or a greenhouse during the winter if you’d prefer to grow oranges in the colder areas of the country. This entry was posted on Tuesday, August 11th, 2009 at 7:40 pm	and is filed under American Flowers. You can follow any responses to this entry through the RSS 2.0 feed.